Those of you who deal with third-party control of BSS Soundweb devices may have encountered the need to inspect the data traveling between devices. Soundweb is a binary protocol, which is great for reducing the amount of data that travels over the network. The disadvantage to this method is that the data is not human-readable, which can make troubleshooting difficult. 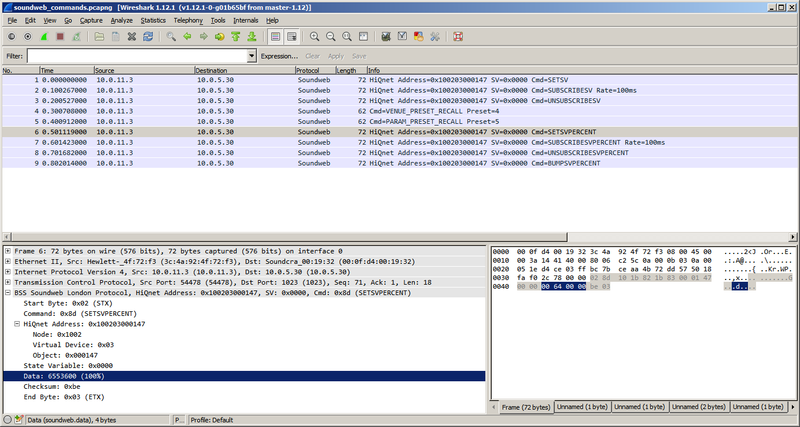 To solve this problem, I created a Soundweb dissector plugin for Wireshark, a popular network analyzer utility. Using the Soundweb dissector, the binary protocol data is displayed alongside of its corresponding decoded, human-readable values. For example, the hexadecimal value FFFEF072 traveling across the network would be decoded and displayed as -14.2 dB, a far easier value to understand. An example of this is shown in the Soundweb dissector screenshot. Start using the Soundweb protocol dissector by following the links below.